The late Peter Mason bequeathed a wealth of material to the village and the History Group felt it should be preserved for future generations. Peter Mason had accumulated twelve lever arch files on Beckingham and Saundby village history (a lifetime's research) which included notes, letters, photographs, slides, deeds etc. The History Group's first task was to transfer all this material to computer which entailed an enormous amount of work; typing, cataloguing, indexing and scanning. The group meet regularly in the The Old Willow Works every last Thursday in the month where the planning of work is carried out. The first project the group worked on was a 2007 calendar that was produced in 2006 and which a copy was given to every household in Beckingham and Saundby. Further copies were available to purchase for a small fee. In 2007 a booklet of photographs of Beckingham and Saundby entitled "Photogaphic Memories of Beckingham and Saundby" was produced. This book, again, was given free of charge to all households in the villages and additional copies are still available to purchase - please contact the website if you wish to place an order. The group produced a calendar for 2017 of which a copy was given to every household in Beckingham and Saundby. To support the items the History Group have produced they have held Open Days in the village to promote their work and collections which have been very successful and have provided an opportunity to involve and invite members of the community and also people outside the community. In addition to the Open Days held in Beckingham the group have also taken to the road to display their material at Gainsborough Old Hall (18th November 2006) and Newark Town Hall (22nd November 2006). Other local groups from around the area attended these events and were promoting their individual village schemes. On 27th June 2007 The History Group visited The Museum of Lincolnshire Life where it was believed to hold some miniature baskets produced by workers at The Old Willow Works (and later donated by Mr Gale). Finally, on 17th October the group went on a trip to The Nottingham Archives Office and saw a selection of historical artefacts held there relating to the villages and received a brief descriptive talk on how the artefacts are stored and recorded. The History Group continue their work, collating more information - in 2007 a copy of a Beckingham Map dated 1736 was acquired and due to Margaret Mason's forthcoming move away from the village more material has been donated from her late husband's collection. 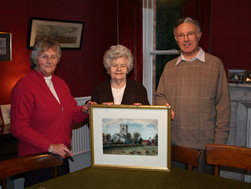 Margaret Mason had very kindly allowed the group to store material/equipment at The Hall and in appreciation of this they presented her with a framed print of a painting of All Saints' Church dating back to 1881 (see image above).